I enjoy learning about all of the events in and around World War II, especially the Pacific theater. I was reading the book Miracle at Midway by Gordon W. Prange (et. al.) and started to get curious about the pre- and post- histories of all the naval vessels involved in the Battle of Midway. Historically, so many people, plans, and materials had to merge together at a precise moment in time in order for the Battle of Midway to be fought where it was and realize its radical impact on the outcome of World War II. I got curious as to the pre- and post-history of all the people and ships that fought at Midway and wanted a way to visualize all of that history in a mobile application. I am not anywhere near constructing my vision of fully time and space dynamic filtered ship history maps yet. The keyword being: Yet. This story details one tiny step I undertook to try and get to my goal against a found data source. I found a whole set of plain text ship histories as part of the Dictionary of American Naval Fighting Ships (DANFS). An awesome Pythonista had already ripped the DANFS site content into a SQLite database which contains all 2000+ ship histories. – Thanks jrnold! The ship histories are interesting to read but are not organized in a machine friendly format. The histories are largely just OCR’d text + a little HTML styling markup which was embedded as a side effect of the OCR process. I fully acknowledge that beggars can’t be choosers when it comes to data sources of this type. DANFS is as good a place to start as I could find this side of petitioning the National Archives for all naval ship logs. As any data scientist will tell you: You will spend 90% of your time cleaning your data, then 10% of your time actually using your data. In this case, most of the ship histories are written in chronological order from past to present (once you separate out some header text regarding the background of the naming of the ship). In theory, if we just had a way to markup all the location names in the text, we could process through the text and create an in-order list of places that the ship has visited. Please note: All this is largely naive. It’s actually much more complicated than this, but you have to start somewhere. Needless to say: I don’t want to do location identification by hand across 2,000+ free text ship histories. We are talking about the entire history of the American Navy. Having to classify and separate out locations by hand, by myself, is a huge task! Note: I continue in this post by using Stanford NER due to its C# / .NET compatibility. You may also want to check out Apache openNLP. Also keep in mind that you can also pre-process your data using NER / Natural Language Processing (NLP) and feed the results into ElasticSearch for even more server side search power! supported X-ray transfers and surgical procedure consultations. that supported X-ray transfers and surgical procedure consultations. Notice the ORGANIZATION and LOCATION XML tags added to the text? I didn’t put those into the text by hand. Stanford NER took in the raw text from the ship history of the U.S.S. Abraham Lincoln (CVN-72) (Before) and used the machine learning trained model to markup locations and organizations within the text (After). These models each use distributional similarity features, which provide some performance gain at the cost of increasing their size and runtime. Also available are the same models missing those features. All the parts at the top of the diagram labelled ‘Machine Learning’ (with black borders) are already done for you. The machine learning + training output is fully encapsulated and ready for use via models available for download as a handy 170MB Zip file. 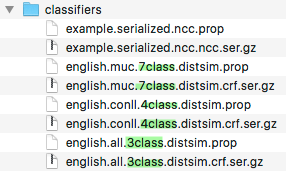 It is one of these 3 models that you will use to initialize the CRFClassifier in your client code depending on your needs. 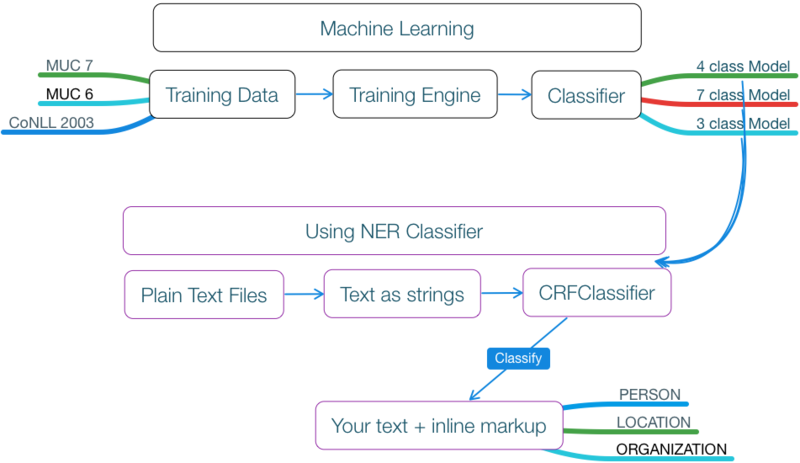 The parts at the bottom of the diagram in the ‘Using NER Classifier’ space (with purple borders) are what you will do in your client code to get person, location, and organization markup placed within your text. Check out the instructions on how to do this in C# / .NET. The key to the client code is the CRFClassifier from the Stanford.NER.NLP NuGet Package. The CRFClassifier takes in your text and the trained model output file, from the above zip file, to do classification of person, location, and organization within your text. Log to console during processing and manually create filtered lists of interesting data. These lists can also be fed back as training data for future machine learning runs. Filter values on created lists from source data. All that said, Named Entity Recognition gives you a fun and solid starting point to start cleaning your data using the power of models from machine learning outputs. I highly recommend using Stanford NER as one or more stages in a pre-production data cleaning pipeline (especially if you are targeting the data for rendering on mobile platforms). Beware: your data may have a series of false positive PERSON, ORGANIZATION, or LOCATION tags written into it by Stanford NER that may have to be filtered out or augmented by additional post-processing. In my case Stanford NER also marks up the names of people in the text with PERSON XML tags. You may notice that Abraham Lincoln above is part of a ship name and also the name of a person. In my first run of this ship history text through Stanford NER, the text Abraham Lincoln was surrounded by PERSON XML tags. Having 1,000 occurrences of the person ‘Abraham Lincoln’ in a ship history about the U.S.S. Abraham Lincoln is probably not very useful to anyone. I had to run a post-processing step that used the XML DOM and removed any PERSON, ORGANIZATION, or LOCATION tags if the parent of those tags was an ‘i‘ tag. I found that ‘i‘ tag was written into the original history text from DANFS to indicate that it is a ship name so it was the easiest (and only) data marker I had to aid in cleaning. The same problem would occur for the U.S.S. Arizona, U.S.S. New Jersey, U.S.S. Missouri, and other text where locations, people, or organizations were used as ship names. I fully intend on trying to use machine learning, and alternate training sets for Stanford NER, to ensure that PERSON, ORGANIZATION, and LOCATION tags are not written if the text is within an ‘i’ tag (but haven’t done this yet). My initial implementation to include the honorific and/or rank of the person was problematic. After the NER stage, I scan through the XML output using System.Xml.Linq (i.e. XDocument, XNode, XElement) looking for any PERSON tags. Using the XML DOM order I went to the previous text node right before the start PERSON tag. I then displayed the first 3 words, as split by a space, at the end of the preceding text node. My second pass at determining the honorific of a person may just involve a custom training stage to create a separate ‘Honorific’ model trained by the set of honorific data I have derived by hand from the whole DANFS text data set. As stated above: Data scientists spend way too much time cleaning data using any technique that they can. On this project, I found that I was never really ever done extracting new things from the data, then cleaning the output data some more in a never ending loop. I hope in the future to provide all the sample cleaned DANFS data, my data cleaning source code, and a sample mobile app that will interactively render out historical ship locations.